The collection of the Museum of Fine Arts in Ghent (MSK) is supplemented with an additional painting by James Ensor: Les Poissardes mélancoliques (The Melancholy Fishwives, 1892). The owner of the artwork, which was auctioned in 2015 at Sotheby's New York for a new record for the artist, is lending it to the MSK for at least two years. The painting is now displayed as part of the exhibition Verhaeren Revealed: the writer, critic and the art of his time (1881-1916) before being moved to the permanent galleries. In 2015, an extraordinary painting by the Ostend artist James Ensor went under the hammer at Sotheby's New York. Entitled Les Poissardes mélancoliques, it formerly belonged to one of Ensor's patrons, François Franck, and is a pre-eminent work within the artist's oeuvre. In this canvas, the painter combined two of his favourite themes: the ordinary fishing folk that he saw around his home town and the grotesque skeletons that appear in many of his other paintings. The work is not only striking for art historical reasons, however. It immediately became the most expensive work by Ensor sold on the open market. A painting of such high calibre, with its lively style and fascinating iconography, undoubtedly possesses all of the fundamental qualities associated with Ensor's art. As such, it will greatly enhance the appreciation and understanding of Ensor's work amongst Belgian and, by extension, European audiences. Consequently, the new owner began to search for the ideal place to display Les Poissardes mélancoliques and the MSK presented itself as a candidate for the provision of a new and temporary home. The artwork is on loan to the museum for at least two years. It will first be seen as part of Verhaeren Revealed: the writer, critic and the art of his time (1881-1916). This exhibition, which runs from 15 October 2016 to 15 January 2017, highlights Verhaeren's role within the Belgian and European fin de siècle art scene. Within the presentation, Verhaeren's admiration for James Ensor's multifaceted oeuvre is also brought to the fore. At the close of the exhibition, Les Poissardes mélancoliques will move to the permanent galleries where it will remain on view until the autumn of 2019. The work fits perfectly within the MSK collection. The art of the late 19th and early 20th century is a special area of expertise within the museum and a cornerstone of its day-to-day activities. Within the displays dedicated to Symbolism and Expressionism, James Ensor is a particular focal point, and not just as a painter, but also as a draftsman and printmaker. 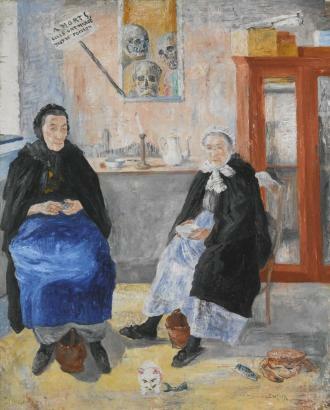 The MSK has five paintings by Ensor in its collection: Willy Finch dans l'atelier (ca. 1880-1882), Vieille Dame aux masques (1889), Squelette regardant des chinoiseries (1885), which was acquired by the King Baudouin Foundation and placed on loan, Les Enfants à la toilette (1886), which was purchased by the Flemish Government and is also on loan, and Pierrot et squelette en robe jaune (1893). In addition, the museum owns several drawings by Ensor, including L'Entrée du Christ à Jérusalem (1885) from the series Les Auréoles du Christ. In 2004, the Flemish Government acquired Le Christ montré au peuple (1885), the pendant to the Entrée du Christ, and loaned it to the Ghent institution. Last year, the MSK augmented its collection of drawings with Le Christ pleuré par les anges (1886) and Faire des Grimaces (1889). The institution also possesses an important ensemble of etchings by Ensor.